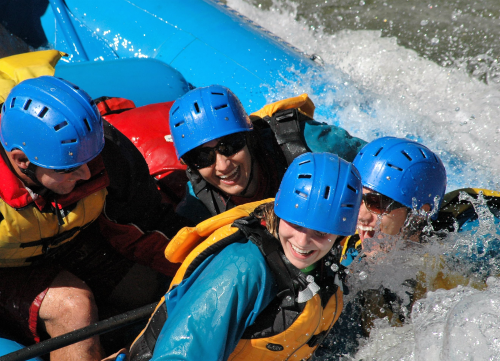 Treat yourself with Colorado’s best quality RAFTING Adventures! The Adventure Company has put emphasis on safety and quality for more than 30 years, allowing you and your family to enjoy your whitewater adventure to the fullest. Whether it's beginner, intermediate, advanced, or expert whitewater that floats your boat, we have the perfect trip for you! As an established Breckenridge company since 1987, we offer daily pick-ups in Breckenridge, Frisco and Keystone. Besides our daily 1/2 Day, 3/4 Day with lunch and Full Day rafting adventures we also offer customizable trips such as: Overnight/multi day rafting trips, team-building kayaking & rafting trips, bachelor/bachelorette parties, full moon rafting and much more! Let our experienced guides spoil you and help you to make lifelong memories! We feel that the most important way to help ensure a safe and enjoyable Colorado whitewater raft trip is to have an experienced raft guide controlling your boat. The Adventure Company is the ONLY outfitter in Colorado that exclusively employs guides who are at least in their fourth year of professional guiding. This us unheard of in today's industry! Not only do we have experienced raft guides, but our trips are packed with top quality features! We are Colorado's ONLY outfitter that hires guides at least in their fourth year of professional guiding to help ensure your safety and enjoyment. We are proud to be one of the few Colorado whitewater rafting companies capable of offering expert (Class V) raft trips. This is only possible because of our experienced guides' skill, high performance equipment, and unwavering commitment to safety! We serve delicious, healthy and hearty hot meals. Enjoy our Ultimate Fajita Feast hot lunch on all 3/4 and full day raft trips. Savor gourmet outdoor cooking on our Multi-Day & Overnight rafting trips. For your comfort and safety, all of our equipment and vehicles are regularly cleaned, maintained and updated. Our sanitized wetsuit rental gear is always clean and comfortable. We are Colorado's only outfitter to offer you such a wide selection of 25 raft trips from beginner to expert on 4 rivers, overnight rafting trips, and full moon rafting! We also offer 14 other outdoor activities, multi-activity packages, and lodging. We have activities for kids, adults and those for the whole family to enjoy together! Choose on-site comfortable lodging at A Riverhouse Lodge. Other amenities include our Office/Outfitter Store, an organized boathouse, changing rooms, men's and women's separate bathrooms with showers, ample parking, shaded picnic courtyard, and our Riverview Nature Trail. Enjoy top quality rafting at competitive prices. Let our experienced adventure team put you at ease, allowing you to have the time of your life!